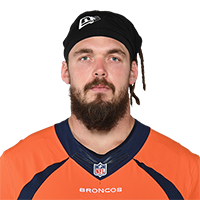 The Broncos have officially exercised the 2019 option on Wolfe's contract, Mike Klis of 9News Denver reports. Analysis: Denver could have saved over $8 million in space by letting him walk, but the Broncos will instead keep Wolfe around as the 29-year-old enters the last year of his contract. He's more valuable in real life than fantasy, though, considering Wolfe has accrued just 74 tackles and 3.5 sacks on 1,169 defensive snaps over the past two seasons. Wolfe (concussion) is active for Saturday's game against the Browns. Analysis: The expectation was that Wolfe would be healthy to play, and the team confirmed it Saturday when he was not listed on the inactive list. Wolfe has just 1.5 sacks through 13 games this season but could have more opportunities with the likes of Shaquil Barrett (hip) and Shane Ray (coach's decision) sidelined. Wolfe (concussion) is questionable for Saturday's game against the Browns, Nicki Jhabvala of The Athletic reports. Analysis: Wolfe cleared the league-mandated concussion protocol Thursday, so the expectation is that he'll be ready to go this weekend. If Wolfe were to sit out against the Browns, Zach Kerr would receive an increased workload along the defensive front. Coach Vance Joseph said Tuesday that Wolfe is in the league-mandated concussion protocol, Nicki Jhabvala of The Athletic reports. Analysis: Wolfe appears to have sustained a head injury during Sunday's 20-14 loss to the 49ers. If the starting defensive end is unable to suit up against the Browns on Saturday, expect Zach Kerr to benefit from an uptick in snaps. Wolfe (ribs) won't carry an injury designation into Sunday's game at San Francisco, Ryan O'Halloran of The Denver Post reports. Analysis: Wolfe sustained a small cartilage tear in his ribs during last Sunday's win over the Bengals, but he's apparently healthy enough to avoid the questionable tag. It remains to be seen if the 28-year-old faces any limitations from the injury, but he should take up his usual starting spot at defensive end against the 49ers. Coach Vance Joseph said Monday that Wolfe (ribs) is day-to-day, Troy Renck of Denver 7 News reports. Analysis: Wolfe suffered a "small tear in rib cartilage" during Sunday's 24-10 win over the Bengals. It's positive news that the veteran defensive end is not nursing a significant injury, but his Week 14 availability nonetheless remains in question. If Wolfe were to miss any time, Zach Kerr would benefit from an increased defensive role. Wolfe said following Sunday's game against the Bengals that he didn't suffer any broken ribs, Ryan O'Halloran of The Denver Post reports. Analysis: Wolfe left Sunday's game due to the injury and ultimately was ruled out for the remainder of the game. The fact that Wolfe didn't suffer any breaks in his ribs is a positive sign for his Week 14 availability. Expect next week's practice report to give a clearer indication as to whether Wolfe can suit up against the 49ers in Week 14. Wolfe is ruled out to return to Sunday's game against the Bengals, Troy Renck of Denver 7 News reports. Analysis: Wolfe was initially listed as questionable to return Week 13 but will ultimately remain sidelined for the rest of Sunday's tilt against the Bengals. Wolfe is questionable to return to Sunday's game against the Bengals due to a ribs injury, Nicki Jhabvala of The Athletic reports. Analysis: Wolfe is a key piece of the Broncos' defensive front, and the extent of his injury remains undisclosed. Zach Kerr is expected to slot into the starting lineup as long as Wolfe remains sidelined. 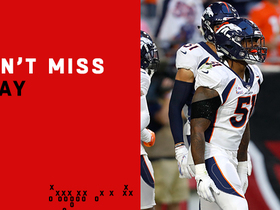 Wolfe recorded four tackles (all solo) and a sack across 42 defensive snaps in Sunday's loss to the Texans. Analysis: Wolfe has never specialized in reaching the quarterback, as his season-high sack total came during his rookie season when he recorded six. Therefore, it's not all that surprising it took nine games for him to notch his first sack of the year. He'll now get some time off to rest before taking on the Chargers in Week 11. Wolfe (ribs) is absent from Friday's injury report, Nicki Jhabvala of The Athletic reports. Analysis: Wolfe suffered a ribs injury during the Broncos' win over the Cardinals in Week 7, but he appears to have fully recovered. The veteran defensive end will start against the Chiefs on Sunday. Wolfe suffered a rib injury Thursday against the Cardinals and is probable to return, Zac Stevens of BSN Denver reports. Analysis: The veteran defensive end has had his fair share of bumps and bruises this season, as he exited Sunday's loss to the Rams with a hamstring issue. Given that the Broncos have a healthy lead, there is a good shot the team decides to shut Wolfe down for the remainder of the contest. Wolfe left Sunday's game against the Rams with a hamstring injury but returned soon thereafter, Zach Pereles of the Broncos' official site reports. Analysis: That's good news for the Broncos' pass rush, although Wolfe has only registered half a sack on the year. He does have four passes defensed, however. Zach Kerr is on standby if Wolfe aggravates the injury later. Wolfe (abdomen) was a full participant at Friday's practice, Nicki Jhabvala of The Athletic reports. Analysis: Wolfe was dealing with an abdominal muscle strain and was a limited participant Thursday, but his full return to practice Friday confirms the minor nature of the injury. 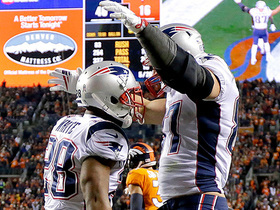 The 28-year-old should start at defensive end for the Broncos on Sunday. Wolfe was a limited participant at Thursday's practice with an abdominal muscle strain. Analysis: Coach Vance Joseph downplayed Wolfe's injury, saying "He's okay. He'll be fine," but the specifics of the issue remain unclear. The 28-year-old played 47 of 57 defensive snaps in the season opener, but he registered only a single tackle in the contest. Wolfe (stinger) played 24 defensive snaps during Friday's 29-17 preseason win over the Redskins. Analysis: Wolfe made one tackle during the game, and he will likely sit out the preseason finale against the Cardinals. The seven-year veteran made 31 tackles and two sacks in 2017. Wolfe suffered a stinger during Tuesday's practice and left practice for the locker room as a result, Mike Klis of 9News.com reports. Analysis: Wolfe, who underwent neck surgery this offseason, had returned to full health before suffering this recent stinger. The issue shouldn't keep him sidelined for long, however, as he's expected to return Wednesday. Wolfe (neck) has recovered from offseason neck surgery and is ready to return to action, Troy Renck of TheDenverChannel.com reports. "I feel great, dude," Wolfe said. "I am lifting weights, heavy. I am doing 500-pound dead lifts, doing big squats. I had 225 pounds on my back doing straight leg squats the other day. I am good. I am using 150 pound dumbbells for bench press, I am good. Whatever they want [in offseason workouts]. They want me to put a helmet on? I will go. I am ready." Analysis: Wolfe has reportedly been dealing with nerve pain over the past two seasons, prompting the defensive lineman to undergo surgery on the right part of his neck back in February. Two months later, the 28-year-old appears to be fully recovered in time for organized team activities later this month. 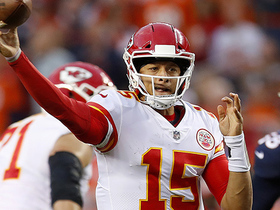 He'll now focus on returning to form on the field after a rather disappointing 2017 campaign in which he recorded 31 tackles and two sacks in 11 contests. Broncos general manager John Elway said Wednesday that he expects Wolfe to remain with the team for the start of the 2018 campaign and make a full recovery from offseason neck surgery, Nicki Jhabvala of The Denver Post reports. "Sounds like [Wolfe] is doing really well. He's happy with the surgery so far," Elway said. "[Wolfe] is another one we plan on going forward with." 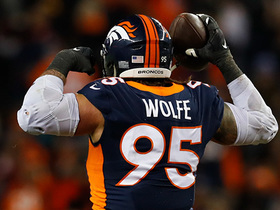 Wolfe underwent offseason surgery to relieve nerve pain on the right side of his neck and indicated that he's feeling better than he has at any point in five years, Mike Klis of 9News Denver reports. "I can honestly sit here and tell you that as far as my neck goes -- I have to build my strength back up...but [the neck is] fixed," Wolfe said. "I feel so much better." Analysis: Wolfe had been dealing with the nerve pain during both of the past two seasons, causing him to miss seven games total, including the final five contests of the 2017 campaign. After undergoing surgery, Wolfe said that his neck has full functionality again, clearing up concerns about the defensive end's availability for training camp. The 27-year-old is still working to regain strength, however, so he could be limited during the Broncos' offseason program. 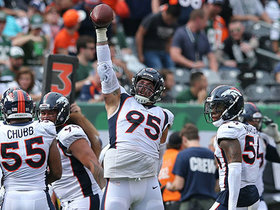 Defensive coordinator Joe Woods said Wolfe (neck) is recovering well and believes that doctors have "finally found the problem" in regard to the exact nature of the defensive end's injury, Carl Dumler of Scout Media reports. Analysis: Wolfe, who spent the final five games of the 2017 season on injured reserve, revealed last December that he's experiencing spinal stenosis in the C7 segment of his neck. Wolfe himself has previously expressed confidence that this injury won't end his career, but he still needs to gain medical clearance in order to take the field again. Fortunately, the chances of that happening seem favorable at this juncture, putting to rest any talks about his potential retirement. Wolfe has spinal stenosis in the C7 segment of his neck, Troy Renck of Denver 7 News reports. Analysis: Wolfe reiterated that this won't be the end of his career, as he wants at least four more years in the league. However, he admits that an elbow injury he suffered in the 2016 campaign made his neck injury worse, as he would engage with his head and neck more on tackles. The sixth-year defensive end had 31 tackles (18 solo) and two sacks through 11 games in 2017. Wolfe (neck), who was placed on injured reserve Tuesday, won't require surgery but will require a couple months to recover from the injury, Nicki Jhabvala of The Denver Post reports. Analysis: The Broncos opted to shut down Wolfe for the season when the defensive end experienced numbness on the right side of his body after suffering the neck injury in the team's Week 12 loss to the Raiders. Though Wolfe was officially diagnosed with spinal stenosis, the injury doesn't look to be career-threatening, so the expectation remains that the 27-year-old will be back to full strength by the time training camp arrives next summer. Wolfe was placed on injured reserve Tuesday, Aric DiLalla of the Broncos' official site reports. Analysis: Wolfe lands on IR after suffering a neck injury in Week 12's loss to the Raiders. Wolfe started 11 games for Broncos, recording 31 tackles (18 solo) and two sacks in the process. Shelby Harris, who started last Sunday in Wolfe's absence, should continue to see increased defensive reps for the remainder of the season. Coach Vance Joseph said Monday that Wolfe (neck) could be placed on injured reserve, Nick Kosmider of The Denver Post reports. Analysis: Wolfe missed his first game of the season Sunday due to the neck injury he suffered in the previous week's loss to the Raiders. He's failed to practice since, and it doesn't look good for the 27-year-old. With the Broncos' season pretty much a lost cause already, it would not be surprising to see the team exercise caution with the lineman and shut him down for the year. Wolfe (neck) won't play in Sunday's game against the Dolphins, Zac Stevens of BSNDenver.com reports. Analysis: Wolfe will be sidelined for the first time all season after the sprained neck he sustained early in last week's loss to the Raiders prevented him from practicing this week. The Broncos will likely roll with a defensive-end rotation of Adam Gotsis, Shelby Harris and Zach Kerr with Wolfe unavailable. Wolfe won't return to Sunday's game against the Raiders because of a neck injury, Nicki Jhabvala of The Denver Post reports. Analysis: Wolfe struggled with a neck injury earlier this season, and this new injury likely is related to that. The sixth-year pro has 30 tackles (18 solo) and two sacks this season, and he'll be replaced by a mix of Zach Kerr and Shelby Harris for the time being. Wolfe (neck) is free from the Broncos' injury report heading into Sunday's game against the Patriots. Analysis: Wolfe sat out Thursday's practice, but it now appears like the team was just giving its starting defensive end time to rest, as he returned in full form Friday. He is seemingly on track to suit up in the Broncos' Week 10 contest. Wolfe did not participate in practice Thursday due to a sore neck, Troy Renck of TheDenverChannel.com reports. Analysis: While the injury seems minor, it is definitely something to keep an eye on throughout the next couple days. Look for more updates to come once Friday's injury report is released. Should Wolfe miss time, look for Zach Kerr to see increased reps on defense. Cleveland Browns quarterback Baker Mayfield gets hit as he throws and the Denver Broncos recover the fumble. Denver Broncos linebacker Todd Davis catches a tipped throw by Arizona Cardinals quarterback Josh Rosen for a six-pick during Week 7 of Thursday Night Football. 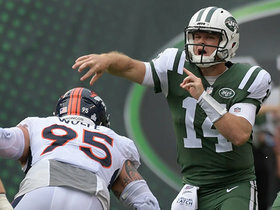 Denver Broncos defensive end Derek Wolfe intercepts a throw from New York Jets quarterback Sam Darnold that was tipped by Denver Broncos outside linebacker Shane Ray. 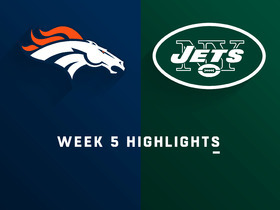 Denver Broncos outside linebacker Derek Wolfe sacks New York Jets quarterback Sam Darnold during third down inside the red zone. 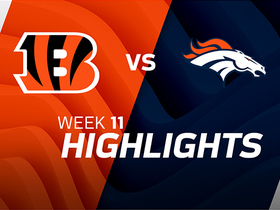 Watch the best plays from the week 11 matchup between the Cincinnati Bengals and Denver Broncos. New England Patriots running back James White beats Denver Broncos safety Will Parks and dives into the end zone for a touchdown. 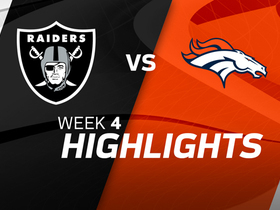 Watch the best plays from the Week 4 match up between the Oakland Raiders and the Denver Broncos. 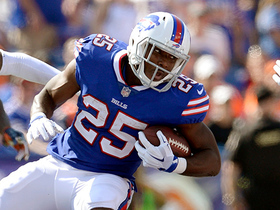 Buffalo Bills running back LeSean McCoy shakes Denvers Broncos' defenders for a 12-yard gain.